Using a sauna is one way to detoxify your body. When you use a sauna, your body creates an artificial fever, purging toxins, and creating white blood cells to fight off bacteria and illness. Your skin cleanses as your pores open and release trapped dirt and oil. Folk medicine used sweat therapy to treat illnesses, and many cultures still use them today. Clean and prepare the sauna for use. With the sauna door open and turned off, wipe down the sauna with warm soapy water and rinse thoroughly. Turn the sauna on and wait for the sauna to heat up, approximately 30 to 60 minutes. Lay a towel down on the sauna bench and roll another one to use as a pillow. The sauna bench gets hot, so be sure to use a body-length towel on the bench so your skin doesn't burn. Use a pillow or another towel to cushion your head from the hard wooden bench. Prepare a mixture of essential oils for aromatherapy. Add 4 to 6 drops of essential oil to a liter of water, and pour this mixture over the rocks. Do not apply pure essential oil directly on the rocks without diluting with water. Apply a moisturizing treatment to rough skin patches. Apply moisturizer that does not contain mineral oil, petroleum, or glycerin because those ingredients trap moisture and prevent moisture loss. You need to lose moisture through your perspiration in order for your body to remove toxins, so use a body oil such as avocado or olive oil. 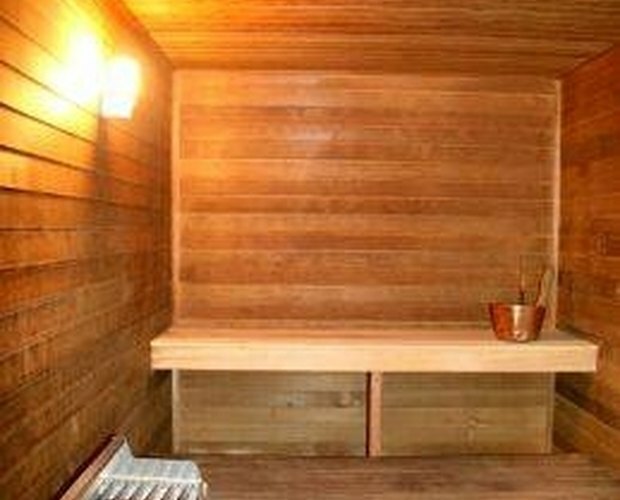 Sit in sauna for 10 to 20 minutes. For beginners,only 10 minutes at first until you learn how your body reacts to the sauna sensation. Inhale and exhale through your mouth, taking deep breaths. Your lungs are working harder to expel toxins as your body temperature rises and demands more oxygen. Step out of the sauna and drink water. Replace water lost through perspiration. Water also helps facilitate toxin removal through your digestive system. Do not drink too much water, more than a liter during a break session, in order to prevent dizziness from a full stomach. Take a cold shower. This is a popular method used by advanced sauna users to improve circulation in the capillaries and tightens muscles. Perspiration eventually evaporates, but taking a shower removes salty components and other debris on your skin. To balance your ecosystem, your cool off period should equal the same amount of time in the sauna, so you should break for 20 minutes if you spent 20 minutes in the sauna. 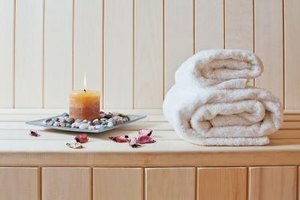 Consider using lavender, ylang ylang, and eucalyptus essential oils in the sauna. Lavender essential oil helps with meditation, stress, and high blood pressure. Eucalyptus is good for opening the sinuses and ridding yourself from a cold. Use ylang ylang for stimulating hair growth and balancing oily skin. You must have water before and after your sauna session. Take a bottle in the sauna with you if you wish, but the water will not stay cool in the sauna. If you have a medical condition, such as heart disease or pregnancy, talk to your doctor before using a sauna. Do not drink alcohol at any time before or during your sauna session. If you feel dizzy at any time in the sauna, step out and allow yourself to cool down naturally, without a cold shower.